MILAN – Since prehistory, man has always sought the most innovative solutions and focused in particular on the study of metals, searching for more resistant alloys, less toxic and more suitable for use. Even ancient Romans knew about the relation between metals ad water and 2000 years ago they used to store at night the water in in copper or brass containers for ionized water to drink, cleaner and smoother thanks to an electrolytic reaction. Brass, in particular. caught for millennia the attention of builders and inventors for all the benefits it offers in various sectors from mechanical, building, furniture and electrical equipment up to coins and the musical instruments that are named after this alloy. the silicon serves to deoxidize and favors the creation of the β phase. In the food sector, the brass alloy that is used with more frequency is identified with the BRASS OT 58 – “CW617N” code, and is a standard alloy for hot stamping that associates to the excellent performance of hot-deformability, good workability for removal of chips. It complies with DIN regulations and 4MS group for materials in contact with water intended for human consumption. Can be used in various applications: valves, fittings, accessories for plumbing and heating systems, bolts, handles, clamps and components in general. The chromium present in the alloy makes stainless able to ‘passivate‘, that is, to become covered with a thin coat (3-5 × 10−7 mm), adherent, invisible oxide, which protect it from the action of external chemical agents. If this film is damaged is reformed from the matrix of the steel. Surface structure compact and free of porosity, which prevents the machinery to absorb substances of various nature, whether they be food or detergents, and then the subsequent release of such substances. Stainless steel is the metal that is more often used in the food industry and in the espresso machines, both for its characteristics of robustness that of hygiene. – Excessively high hardness level: rust formation. – Excessively low hardness level: first scale formation. To adjust the water quality, softeners and the reverse osmosis system are the most widespread systems, and they must be properly used. The R & D department of Nuova Ricambi is working more and more with lead-free materials and, particularly, on stainless steel components. 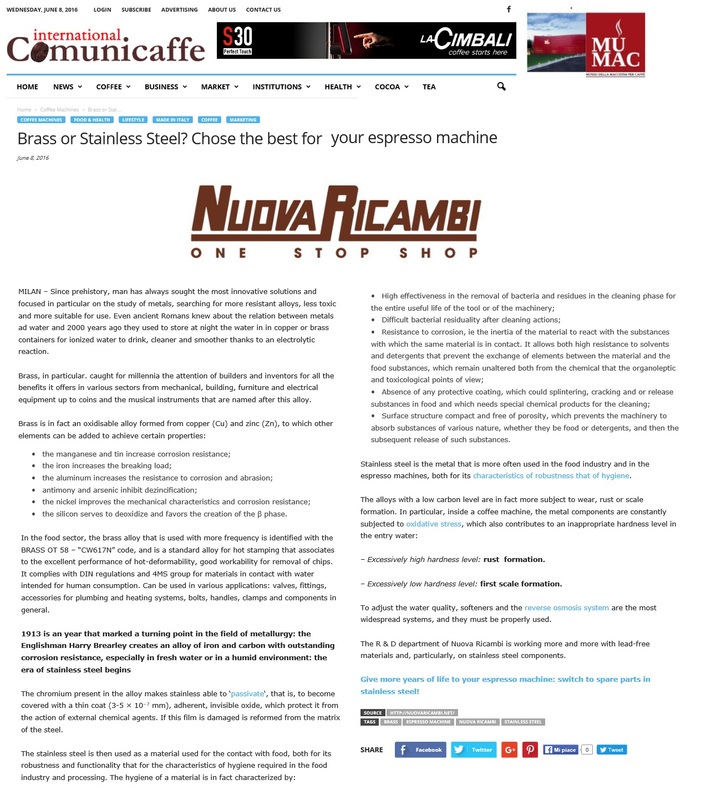 Give more years of life to your espresso machine: switch to spare parts in stainless steel! Nuova Ricambi at Host 2015: it’s been great to meet you!